Silent Spring began with a “fable for tomorrow” – a true story using a composite of examples drawn from many real communities where the use of DDT had caused damage to wildlife, birds, bees, agricultural animals, domestic pets, and even humans. Carson used it as an introduction to a very scientifically complicated and already controversial subject. This “fable” made an indelible impression on readers and was used by critics to charge that Carson was a fiction writer and not a scientist. 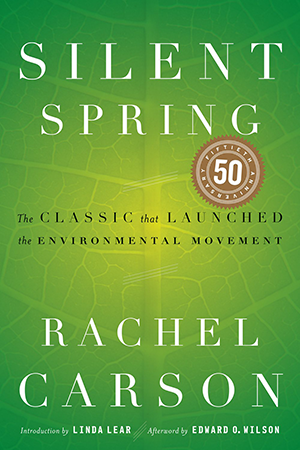 Serialized in three parts in The New Yorker, where President John F. Kennedy read it in the summer of 1962, Silent Spring was published in August and became an instant best-seller and the most talked about book in decades. Utilizing her many sources in federal science and in private research, Carson spent over six years documenting her analysis that humans were misusing powerful, persistent, chemical pesticides before knowing the full extent of their potential harm to the whole biota. Carson expected criticism, but she did not expect to be personally vilified by the chemical industry and its allies in and out of government. She spent her last years courageously defending the truth of her conclusions until her untimely death in 1964.